Vegan Eats and Treats! : MoFo 20: South Indian Black Eyed Peas! MoFo 20: South Indian Black Eyed Peas! As I mentioned, I've got a whole pile of new cookbooks to start exploring... and last night was my maiden voyage with "Vegan Indian Cooking." We're off to a good start! I made South Indian Beans or Lentils with Curry Leaves. Curry leaves are one of my most favorite flavors, so I was stoked to try this recipe. The recipe calls for pre-cooked beans or lentils, so I went with black eyed peas - which have a quiet flavor and paired well with the coconut milk sauce. The recipe called for tons of heat, which I reduced. I used 3 dried red peppers (instead of 6) and a 1/4 teaspoon of powdered red pepper (vs 1 teaspoon). I suppose it could have used a little more heat, but I didn't want to freak myself out. Next time I might use a little more. 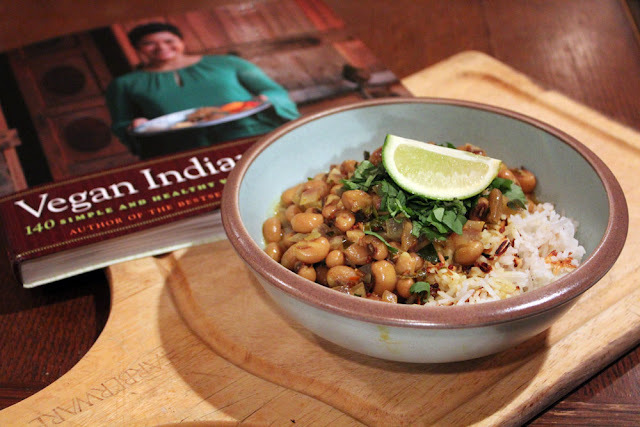 This dish wasn't the most amazing Indian food I've ever made at home, but it was very yummy, we both loved it, and it came together - start to finish - in about 20 minutes. That alone pretty much makes this recipe a winner. In general, this seems like a well-balanced Indian food cookbook - it calls for many "authentic" ingredients (spices, spice mixes/masalas, types of lentils) that might be a little hard to find but that will also result in a more authentic food experience. On the other hand, it's realistic about calling for a can of light coconut milk, or pre-cooked beans (canned or homemade)... so it seems to strike a good balance. It's definitely not for people who aren't willing to branch out and buy some more spices for their cabinets, but it's also not completely inaccessible with the ingredients it calls for. I look forward to cooking more recipes from this book! This weekend is a fun yoga weekend for me - special classes today and tomorrow! 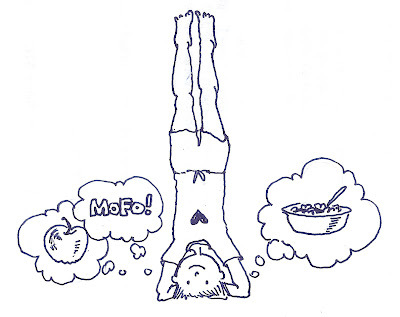 Hopefully I can keep my mind on my practice and not get too distracted by dreams of mofoing! Ooooh. My brother-in-law and his wife gave me this book for Augustmas this year, and I really dig it. I keep wanting to make the curry leaf recipe but also keep forgetting to go to an Indian grocery to buy some. Hope you have a blast with your yoga weekend! Yum, what a lovely looking meal, I probably would have reduced the heat, too! Amey, do you think most of the spices are available at Indian markets, or are they things you've got to order online? I think that the vast majority of the ingredietns would be easily found at an Indian market... and even if you couldn't find something there (like a certain kind of dal, or whatever), I'm sure the staff could direct you to a suitable replacement. I don't think it's an online ordering sorta book. There's nothing that out-there in it. 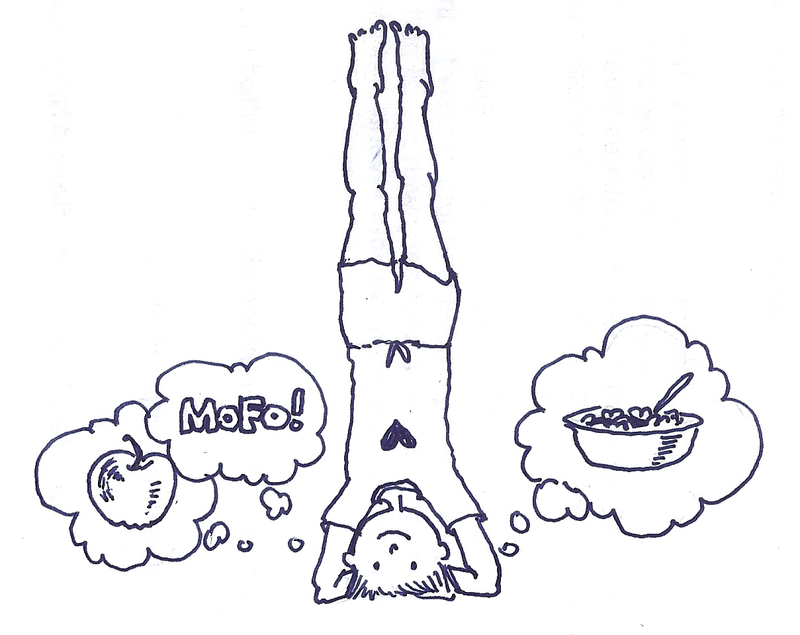 Balance everywhere - in yoga and recipes! I can appreciate that. Nice looking dish; I've been chowing on korma recently! Is there a recipe for korma in her book? I love this book! We can't get tinned black eyed peas here but I love them when I can be bothered cooking them from dried. This dish looks great so I think I should make the effort! I love beans and rice and any recipe that comes together in 20 minutes is a winner in my opinion! 20 minutes to make tea is officially a good recipe. Normally the only thing I can get together in that time is heating up ready-made soup and putting on some toast!